Feed My Starving Children volunteer packages food into bags. On Wed., Mar. 21 Niles West social studies students traveled to Libertyville to volunteer at Feed My Starving Children (FMSC). Students worked at various stations for two hours in order to pack as many boxes as possible for starving children in Haiti. The students packed 117 boxes for those in need in Haiti, which is 25,272 meals, feeding 69 kids for a year. The Volunteer Program Facilitator, Renee Zorc started as a volunteer after retiring because she believed in the FMSC’s mission. But it wasn’t until she traveled to Haiti that she realized the true impact of the organization. 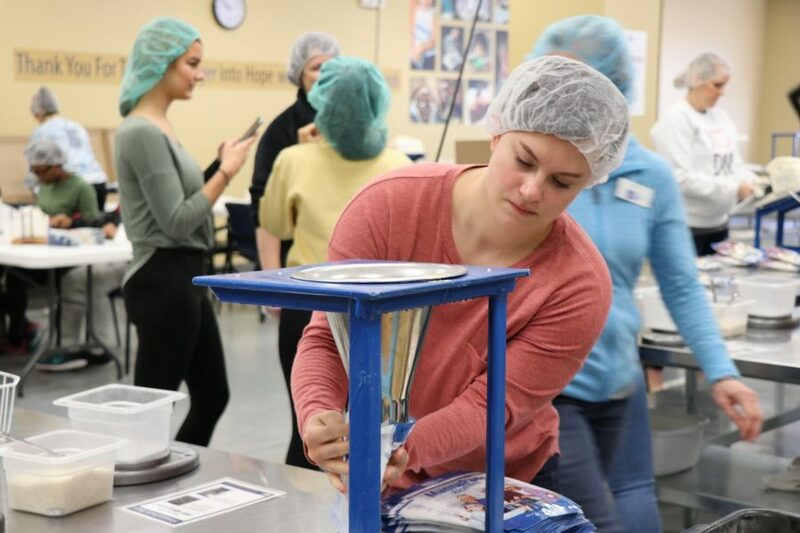 Social studies teacher, Dana Kanwischer has been bringing students to FMSC on a field-trip for a couple years; she hopes to continue this for the years to come. Junior Monique McDonald found this to be a humbling experience because she was able to give back to people in need. “It is my first time volunteering. I’m labeling the bags with expiration labels. I really like it because watching the news and seeing so many starving kids and knowing that I can go home to a meal every day, it’s such a pleasure to come and do this. I can most definitely see myself coming back here in the future,” McDonald said. For sophomore Adem Memidzan, participating in this volunteer opportunity was a satisfying experience.